This book is designed for those who wish to develop their natural gifts or to understand more about the afterlife and see the signs that their loved ones are around them. Firstly, let me introduce myself. 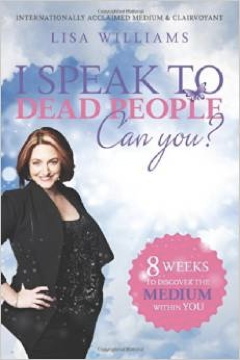 My name is Lisa Williams, and I have been working as a psychic medium for over twenty years. I never planned to work as a medium. I mean, think about it: in the ‘80s, having a career as a medium was never heard of. If I had gone to my teachers and said, “I want to speak to dead people for a career,” I would have been carted off to the nearest mental institute. In fact, there were times that my mother would joke about the men in white coats coming to get me. I thought she was serious, and I grew up thinking that I was a little weird and hiding my ability. I was lucky to have a friend who thought my weirdness was cool. She was always asking questions about it, so I started to feel more comfortable; but as friends do, we drifted apart, and I had a new circle of friends, so I went back into the closet. I still had a growing intuition, but I curbed it and didn’t say anything. I just found that I “knew” things, and I couldn’t really explain it. I was actually quite shy growing up, and I found that I conformed with society about what I believed I should be like. It was easy. I fit the mold, and I didn’t say anything…many people would call that being a sheep and following the crowd. Does this sound familiar to your story? It probably does. Well let me tell you: you are normal. Just because you have this gift doesn’t mean that you have to hide it. For years I hid from it. I even hid it from my own parents for a while. For most of my life, my father has been a huge skeptic, and I remember the time when I had been working as a psychic medium for a while and he asked me when I was going to get a “proper job.” He was an atheist and couldn’t wrap his head around the concept that our soul continues to live on when our body dies. When I finally decided to come out as a medium, it was accepted and most people had a fascination about it. It was “cool” to have this gift. I grew up in the United Kingdom and so we never showed emotions, never went to therapy, and we never said we loved each other. It was a very different world to what we live in now. Going to a psychic or a medium was better than going to a therapist in the United Kingdom. When you went to the therapist you were admitting that you had a problem, it was a sign of weakness. Now it’s considered a gift to be aware of your challenges, and it’s actually character building. I finally surrendered to my gift after my friend helped me see that I wasn’t crazy and that I actually could help others. The rest is history. What I would have benefited from, though, in those early years was some structure, discipline, and understanding. Even though my grandmother worked as a medium she died before I started, and so I didn’t have anyone really to talk too. The only thing that she said to me was: “Always trust your gut instincts. It will never let you down.” That is something I live by, and I will suggest that you do, too. Through my work, I have been guided by Spirit, which has shown me the way forward to work with my gift. I have built my gift on discipline and respect, which is something that I will enforce within you. I have developed the skill of delivering a message, as well as enhancing and fine-tuning my gift. These are things that I will help you with. Throughout this book you will come to understand the history of Mediumship, how to develop your gift, and how to see signs from your loved ones. You will be given daily exercises to enhance your gift and to help you connect to your own loved ones and those of other people.